I have a tutorial that is forty thrillionty times easier and better than my previous (ahem, first ever...give me some grace!) tutorial. It is accessible to infinitely more people (you dont have to have a baby, OR a dress to start out with). And it is really simple. there are only 4 lines of stitching total. Oh, did I mention it's mega cute and chic also? 5 weeks ago I saw this scarf on pinterest. 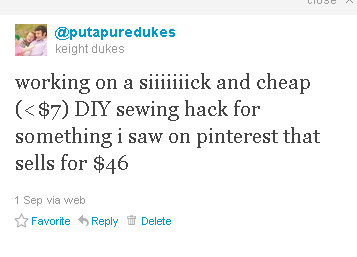 it was pinned by a VERY popular pinner that I follow under her DIY board. I knew I had to make one for myself. 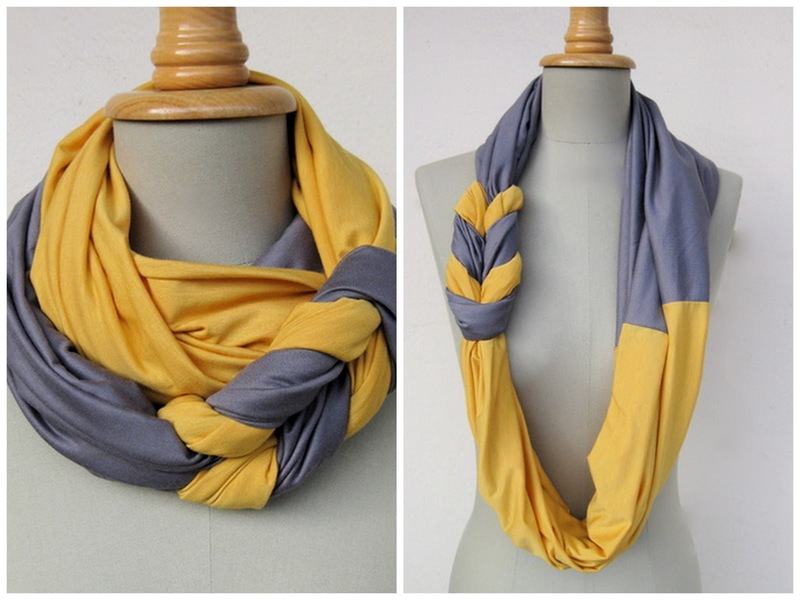 but when I followed this "DIY" link, it actually led to a german store where the scarf was 35 Euros ($60 shipped!). No DIY tutorial = no thanks and bum out! The more I thought about it, the more I wanted this, and wanted it CHEAP. I said out loud in our living room, "I am GOING to figure out how to make this for myself." Then I got busy. the hardest part was figuring out the knot/braid, but Jesse jumped down and took charge like a freaking Eagle Scout. He actually got really handsy and sort of bullied me out of the way. My hackles were up, but no matter! He had figured it out. And then naturally I got sidetracked with sewing orders and running and sleeping and life and never followed through on sharing this with anyone. I never even finished sewing one for myself. So imagine my surprise when I saw that same pinner (with her tens of thousands of followers) linking to a tutorial for this style of scarf last night! I was SO bummed. my laziness had gotten me beaten to the punch. Granted, it's not THAT hard to figure out and there is nothing new under the sun, but I had so wanted to be the first on the scene with the DIY how to (character flaw? yes!). I resignedly went over and looked at the tutorial of my idea-twin. But, hey, as it turns out, the way I did mine was pretty different. The scarf is essentially two big color blocked tubes of fabric "braided" together using square knots. But I noticed the other tutorial attaches the different ends of each tube together by sewing straight across all the layers, thereby closing the tube and forcing it to be flat in the place where the two colors meet up, so you cant twist or rearrange it (imagine a paper towel roll that's been stapled in the middle). The other (now massively popular and pinned, woe is me!) tutorial is very easy and fast and works great if you don't mind the flat section, but I wanted to keep my scarf tubular all the way around so it would be soft and breezy and not squished. My method to accomplish this a little more tricksy, but I personally like the result much more. My rectangles are about 60"x18" each which will create a long scarf looped once but also enables doubling. simply adjust the length if you'd prefer a shorter/longer scarf and adjust the width of this rectangle if you prefer a chunkier/thinner scarf. Just compare the look you want to my finished product on me (i am 5'7, FYI). 1. Upcycling/Recycling: You can pull this project off for FREE by using a big t-shirt to create each rectangle (you're probably going to need a XL or larger. Of course: you can always take a few shirts' fabric and piece them together to get the dimensions we need. 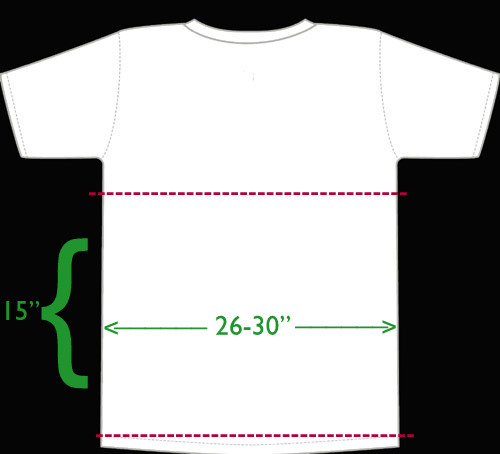 cutting along the red dotted lines at the indicated measurements will create a 2-ply (front and back of the shirt) circley-loop that is 15" high and close to 60" around. you will cut one of the sides (if there was a side seam on the shirt, cut there to eliminate it) to get an open rectangle of fabric. Another option for fabric is to just use yardage from a fabric store. Jersey knits off of a bolt are typically 58" wide. this means that your rectangle's long edge is accomplished by the width of the fabric straight from the bolt, so you only need to order/have cut around 18" of each color. Fabric.com has an awesome selection of jersey knits AND they have free returns, if you're like me and need to feel your fabric before committing! I try to stick with cotton or poly/cotton blend jersey, and this Robert Kaufman Laguna collection is excellent and comes in tons of colors, and works out to less than $10 per scarf. I like the feel of the interlock fabric off the bolt better than t-shirts, but it's totally up to you! Several readers have sent me pictures of scarves they made from their old t-shirts and they totally rock. it's your world....have it your way. Fabric PSA complete. We now we return to your regularly scheduled tutorial. STEP 2: reach your arm inside each rectangle and turn rightside-out. Don't press these seams because we are going for tubular not squashed, remember. Gotta love a step that forbids ironing! The resultant two long tubes of fabric. a: make two loops by folding in the middle of each tube- overlap them on on top of the other. b: reach your arm under the crook of the bottom (blue) loop and grab the ends of the top (purple) loop. c: pull the ends of the top loop back through the crook of the bottom and lay them on top of the bottom crook. d: cinch and straighten making sure the knot is in the middle. e: spread the ends of the top loop out and away from each other. f: reach between the top ends and under the bottom crook to grab the tails of the top ends. g: pull the top ends back through the bottom loop. h: pull through to lay them over the bottom loop. i: pull all four ends to cinch the knots tighter j: squnch and shift to make your knots compact. k: twist and adjust and do what you need to to make the knots uniform and pretty. l: admire! NOTE: you can repeat the steps as many times as you like if you want your knot/braid to be longer. 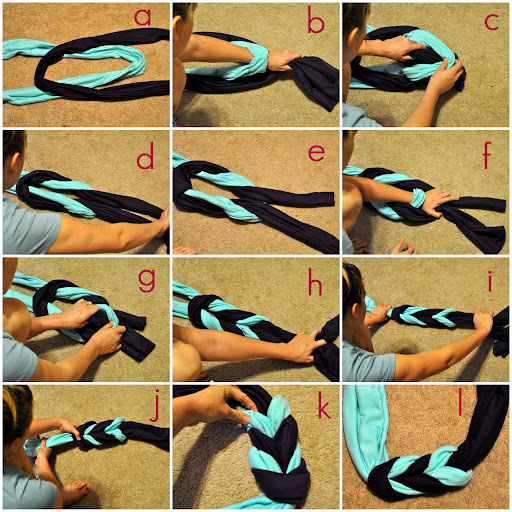 these steps make a braid with 3 sets of V's (just like the inspiration scarf), but you could make as many as you like. just keep in mind that every additional V makes your total length a bit shorter. 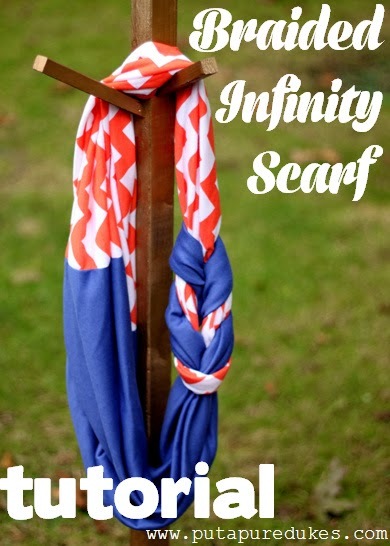 *IF YOU WANT TO MAKE A DOUBLE BRAIDED SCARF STOP HERE. you can pick up with the steps for that tutorial here. STEP 4: lay out your finished knot into an X shape. match up the top tails of the X (one from each side/color), bringing the raw circular ends together. you can add in a few twists on each individual tube before matching the ends up to give your finished scarf that twisty swirly look rather than just a straight loop (i didnt twist mine so you can compare that look to the yellow and gray one which was twisted...i will twist next time!). Top raw tails together, bottom raw tails together. onward to step 5! nice bandaid...hey, guys rotary cutters are mother flipping sharp. fiskars don't play. STEP 10: We hand sew the little openings closed. grab some coordinating thread and a need and blind stitch that puppy closed. 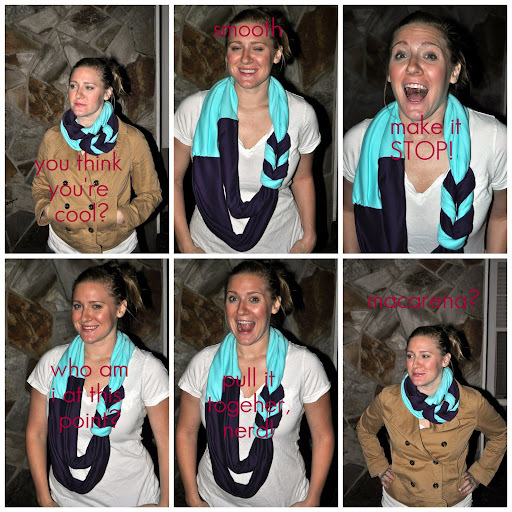 Much more difficult for me than this tutorial was trying to get acceptable shots of me wearing the scarf. ugh. jesse almost lost his head because i was so self-conscious and picky. i HATE having my picture taken by myself. why, you ask? because i need to never been seen by humans. Jesse took his ball and went home so I had to take the un-looped scarf pic by myself. I got a lot of free turquoise jersey...that's why it's in all 3 of my last projects...like the camera strap. the possibilities are endless!!! getcha some! and if/WHEN you make one of these beauties for yourself (or if you plan to sell them using my tutorial), would you PLEASE send me a pic? that would just make my life. you can email it (and any questions about the steps or anything else) to putapuredukes (at) gmail (dot) com. *since a bunch of you asked, I am also now selling these in the colors of your choice in my etsy shop if you're unable or unwilling (no shame in that game!) to make one yourself. CARE INSTRUCTIONS: I highly recommend washing your scarf in a delicates bag. the braid is sewn in so it can never come "untied;" however, it can get all cattywampus whacked out and be a super puzzler to put back together. keeping it isolated in the wash is a safer way to go, and you might even consider putting a somewhat loose rubber band around the braid as well for extra security. This makes me wish in the worst way that I had a sewing machine other than my little sister's janky one that NEVER works right that she got for Christmas because even I could do this no problem. I am going to Idaho in a few weeks and it'll be fallish and awesome (compared to my 80+ California weather) and I would be so awesome if I had a scarf like this that I made. Spend a little & get your sister's machine repaired. I just did and my 30+ year old machine sews like new, I'd forgotten hw wel it used to sew. WHOA love them! me and the roomie are going to try these tongiht for REAL. I will report back with a photo tomorrow. wish me luck. first time sewing. EVER. Stop! Love this so much. Going out to buy some jersey knit today! I love your tutorial. I have been thinking about how to knot this and keep it tubey for days now and you answered all my questions. And don't worry, I promise to re-pin! Consider it pinned! You may not gain notoriety with your onion goggles (perhaps a little too awkward in mixed company?) but I think you have a winner-winner-chicken-dinner here. ALSO- I backtracked the video just to watch your Price is Right hands and the awesome look on your face at the end... And I showed Grant. @lacey: hahaha my face is THE goobieriest. WHY am i so excited and seeking jesse's approval-ish? the pause/backtrack at the end was what i was most afraid of. I am so impressed that you did this! Your tutorial makes me tired just looking through it, and you pulled it off like a champ. Looks great, btw. OK, I didn't get any of the tutorial, and couldn't make this if my life depended on it, but I want one for Christmas, birthday and Mother's Day (include the video, please and thank you!) You're awesome!!!! (so's the scarf!!!!) Love the Game Over pic--who snapped it? Absolute keeper...yeah I see your Old Navy jacket that you snarfed up. Way to display. Ps: love when your mom-in-law comments... she seems lovely! Nice work. Thanks for the very clear steps! oh girl. i saw this post & jumped up and down because i was so excited for it!! way to go for making such a cool (and EASY) tutorial. oh, and BTW, you're pretty. like, really pretty. i thought you should know. Thank you so so so much!!! I was in in love with this scarf from the moment I saw it!! Now I can make it !! Thank you, especially for the video on the braiding part!! You saved me hours of frustration! You made me laugh and gave me inspiration. I heart you! Ok seriously I want so BADLY to make this...and I have read this over and over..and Im still feeling like I missed the bus cause I was too cool for school for today. Perhaps my marine husband who wears a suit and tie to work can make this for me..yes he sews..I dont. Im the plan hatcher he is the "going to make it happen" happener. !!! @~melissa~ which part do you feel like you missed the bus on? i would love to help you out or explain a step better! and what a catch for a hubby: a suit-wearing, sewing marine! this is one of those things that is actually easier to sew than it is to explain. please email me if you need clarification on anything! putapuredukes (at) gmail (dot) com. I'm totally pinning this. Although I'm dork enough that I totally got confused by the sewing loop steps at the end. But I'm ready to run to Yardage Town right now to get me some jersey! Btw, you are hilarious. "Fiskars don't play." I'll be saying that every time I use my rotary cutter now. Thanks for this, I also saw it on piterest and thought that it was a DIY, I had the idea in my head how to do it. So Thank you for showing us and sharing. Yes! I have this scarf pinned and the fabric. I was quite happy to see your tutorial pinned on Pinterest just now. Thanks! I just saw this on a completely unrelated person's pin on pinterest! I'm like... wait a second! Glad I saw it here first. Good for you! I found you via pinterest... I will try this - thank you! I love your blog... you and your family seem so sweet. saw this on pinterest! Had to see how to do it! Thanks! is there any way to put another braidy loop type thing over the other seam? if it is possible, i will never ever figure it out. @brandy. i think there is a way. let me think and experiment and photograph it if it works. great idea! Totally saw this pinned by my SIL. Thought that was cool! Good job on the tutorial! Made it! It is super cute and your tutorial was so easy to follow. Clever woman you are. Good work. I'm gonna post my scarf on my blog and link it back to your tutorial. So my sister & I tried this last night. I apparently was never meant to sew or follow directions because it took me longer than I care to admit to successfully make one! But that is no fault of yours :) We're finishing a few more up this weekend for gifts & I'll send you some pics once they're all done! Btw, before my mom knew we were making these she had pinned a link to your tutorial on her Pinterest (and I hadn't even pinned you yet!) The interwebs are a crazy place. @amanda but you did it, right? that is so cool that your mom is on pinterest!!! cant wait to see your handiwork. model it, chica! So, I have literally not sewn ANYTHING since high school home ec. class and I just made this scarf! I am so excited! Thanks for the awesome tutorial! That's pretty cool!! Love the colour combination (I'm a blue person)! Thanx for sharing, love it! But what I like the most is that you are sooo funny!!!!!!!!!!! I can see that you write like you talk and I love that!!!! The pictures mad me laugh "smooth" LOL you are so funny, thanks!!! You should sell these I would buy it ! You're very cute, and I love this project. Can't wait to try it out! Love the scarf. Thanks for the tutorial. I found you at Pinterest. I am a new follower. Hope you can visit my blog and invite you to follow along too. Oh this is my favorite of all the "turn an old t-shirt into a scarf" projects I've seen. It still looks soft and fun but a bit more polished than the others. Thanks! I saw the same scarf on pinterest and was equally disappointed when it was on a German website with no instructions. So excited that you put up a tutorial! You are freaking hilarious! I love your tutorial!!! I want to make one of these for my mom! Thanks for the help! I like to use exclamation points! Very Cool, I love your sence of humor in your posts!! Love. The scarf and your sense of humor. I just got some cute purple heather jersey, so maybe I'll find a nice complimentary color and whip up a few of these as holiday gifts. Thanks for the tut. Okay, I just made a "monchromatic" version of the scarf because I only had one color jersey. It's cute! (not as cute as two colors, but it'll do) I'll post pics on my blog. @happy serendipity. i think you are understanding me wrong. i definitely wasnt speaking negatively about the german shop whatsoever. it wasnt a rant at all. the only thing i even said about the original was that it was gorgeous and so cool, but the price was too expensive for me to afford it. i LOVE the original scarf. i just felt that $55 to buy and ship this scarf was too expensive for my budget when i could make one myself. just like the people out there who are inspired by designers and stores like anthroplogie, but who cant afford their products, i came up with my own method for making a similar item for much less. no rants, no running anyone down. no judging the price. just using my own time to sew, photograph, and write out a tutorial so that anyone can feel empowered to create their own scarf no matter the budget! and if they dont want/know how to sew? well then hooray for capitalism, wherein they can choose from the many scarves of all nations and prices where to spend their money. hello keight, ok, so i'm sorry for misinterpreting your post. i didn't want to attack you whatsoever. keep up the nice work here on your blog. it's really a nice one. @happyserendipity no problem at all, i understood where you were coming from and why it would upset you if you thought i was disparaging this german store. i definitely dont want to step on any toes or hurt anyone's business. hopefully there are enough cold necks out there that all of our scarf options can be utilized :) thanks for being so kind. I made one last night. I didn't take any pictures wearing it yet; it was way past my bedtime! I did post it on my blog. http://takenpatiently.blogspot.com/ I'm going to try it again with two solid colors, but I really like how the one I made looks doubled. Thanks for all of your hard work with the tutorial! I've been following your blog and your funny but very honest take on life. And then today I saw your scarf featured in a DIY scarf article in Babble. Did you know that they spotlighted your cute scarf? How exciting!!! Guuuuurrrl, this is awesome, and my friday diy project. Someone will be missing two tee shirts tonight! thank you so much for the tutorial!!! i've now planned out all of my christmas gifts!!!!! Just wanted to say thank you for the great tutorial -- I just finished making my first of these scarves (I plan on making more for gifts). Love it! I love the look on your face at the end of that video, haha, brilliant! I'm going to be making these at Christmas :) thanks for the tips!! I needhelp.... Made it but it came untied.... How to fix it? your tutorial ROCKED! And, I love your personality. I tried the tutorial over at Live.Love.Craft by Making Lemonade and it was ridiculously hard to follow. I thought there had to be a better way and searched on Google for Braided Scarf t-shirt and found YOU. Awesomeness. So glad to have my nice *new* scarf! loved loved your spirit . thanks for the wanderfull post. @doralyn...THANK YOU! you might be the first person to have tried both...besides me. i am so glad to know that i am not crazy or egomaniacal thinking mine was a little easier to read! @anonymous. i am not sure what you mean by "it came untied" can you email me with pictures? was it before or after to sewed it shut. the knot may still be in there, but just unrecognizable until you de-tangle and puzzle it out. @katieJ short tubes are the worst! i was totally snickering at that line before i saw your parenthetical comment. we'd totally be friend IRL. Love love love how detailed (and entertaining) your tutorial is! Thanks for figuring out how to make this scarf: That Pinterest pic link bummed me out too, but clearly I'm not a go-getter-suzie-homemaker like you! : ) Kudos! I am not that good a sewing person and don't really know what a blind stitch it, but this turned out pretty well I think! I like your scarf Alsion! Like your colors.. This is great! Thanks so much! Had a bit of confusion after sewing the tubes shut (tied tubes?) as the knot was twisted, but once I figured it out I was very happy :) Made it in all one eggplant colour as a birthday gift for a friend. Fantastic tutorial!! I, too, have been eyeing that exact german scarf!! I wondered and wondered how to make the braid!! THANK YOU, THANK YOU!!! I am going to make this scarf right now! I had the same issue as Melanie. The giant tshirts I got at the thrift store were not long enough. So it will not double over. But it is still cute! I'd say that the point in the beginning about buying the t-shirt fabric at a sewing shop is the best bet. Melanie and Lindsay- thank yall so much for your feedback. i totally understand the issue. i have only made these with yardage (which i totally think is the easiest/best/fastest/cheapest/high quality option). i just got out some of my husband's t-shirts (larges) and i am coming up short as well. i am going to update the tutorial to indicate that you would need a XXL or higher shirt...and to indicate a different cutting/piecing method. i am so sorry for the trouble/hiccup! Thanks for this cute tutorial. I saw it today on Scatter Girls Link up and I've now pinned it to my "Cool Stuff to do with T-shirts" board. I also think your blog is super cute and have pinned it to my cool blogs board. So you have been pinned twice today! Came across your blog via Karley Etherington's pin of her braided scarf and knew it was the perfect gift for my mum. I sourced the fabric from a thrift shop, and made sure they were super cozy, as she lives in Scotland, brrrr! Your tutorial was really well done with clear photos as well as the videos. Thank you for helping to make my mum's 60th birthday present! not sure how to share a picture of my finished scarf??? When I saw this, I thought, "I have to have one!" So that meant that it would make a wonderful gift. Just finished my first with many others to come. It was so easy and turned out great! Thank so you much. LOVE IT! You crack me up by the way. I am going to get to work on my braided scarf tomorrow! I'm so glad I discovered this tutorial! It was really well done- all of the instructions were easy to follow and I'm delighted with the way my scarves turned out. I just made three of them tonight! My only regret is that I didn't find this tutorial a couple of weeks ago before I had all of my Christmas presents made. But I still plan on making a small mountain of them to hand out as gifts throughout the year. Thanks so much for posting this! I made my first scarf last night!!! Thank you for the tutorial! I will say it is a little difficult when connecting the tubes together at the end. Not perfect yet, but it's getting there. Especially since I've never used a seeing machine before!! I made 3 scarves using your tutorial! I love your blog and just became a follower. I wrote about your tutorial on my blog and linked back to you! I'm a fairly good sewer, and will probably end up using shirts. P.S. Thanks for the tutorial! It looks easy enough to follow! if youre a good, fast sewer, and you understand the principles involved here, you can make one of these in a half an hour, easily. if youre piecing together t-shirts as your materials it might take a bit longer, just because of the piecing involved there to get you to your starting rectangles. good luck! To further confuse things, this is Jesse commenting from K8's profile that the last comment was K8 commenting from my profile. I could not make one of these in half an anything. Ok, I may be a dunce, but I'm confused about step 4. HELP! I finally learned how to sew (yesterday), and it was b/c of this scarf! Lo-lo-loooove it! Thank you! Love this. Making one for my daughter in VA Tech colors for Christmas. Found you on Pinterest. Just made this for my friend for Christmas. Turquoise and brown knit--- soooo cute! Thanks for the tutorial! Thanks for the tutorial (and the video-nice TPIR hands by the way!) I did the same thing- saw the grey/yellow, linked and saw the price, 'yiked' and said 'no way'! So as far as I'm concerned, your post was first! Great job! I'm such a 'scarf junkie' I can't wait to make one myself! Just a PS from me- I hit the thrift store today and found a yellow and a white long-sleeve T-shirt for a buck each! Off to craft! Thanks again! Keight, your blog is a hoot. Of course, I know you emulate e.e.cummings with your lower case "i." But as your former English teacher, seeing it does give me pause. (What does Lee think of it?) Ha! I copied this scarf url for my daughter. She has returned to her pre-college, pre-art degree crafty side (it disappeared in interior design classes), and she will love the braided part of it. I am giving her a big hint for a gift for me. I saw this weeks ago and couldn't get it out of my mind. Had to search for it. My first re-pin! Can't wait to try it. And I love the Fiskars don't play band-aid! Great post Keight! I can't wait to try it. BUT more importantly, I need to know about your camera strap! Too cute and looks totally comfy!! I have poked around your site trying to find info on it and I'm not finding it. Could you share how you did it or the link to the post? Thanks so much! @oberheu and everyone who loves my camera strap. if you want to make one yourself, like i did, use this tutorial that my friend raechel made. the tutorial is AWESOME and i just added fusible fleece to my main fabric to make it padded. and if you dont sew and want to purchase one, i sell these in my etsy shop in custom colors and fabrics. TOTALLY going to do! Thanks so much! Oh my WORD! Not only was this informative, but friggin hilarious! I think I could read tutorials by you just for shear entertainment! LOL! Thanks for the step by step! Cannot WAIT to make it! I just made one of these and it took literally 15 minutes! So cute & thanks for the tutorial, it would have taken a lot longer if I had to figure out how to make it! Thank you for the easy to understand tutorial WITH pictures! I can't wait to try this. Me and my friends made these last night!! they are so cute! thanks so much for the tutorial! success! made a dark gray and yellow one, super cute! awesome tutorial and blog. thanks so much! so cute! awesome tutorial! my only problem is finding the colors i want. i want to make some for our high school booster club. any clues on where to get a variety of colors in this material? thanks!!! Love this!! I am a very new sewer and got pretty confused by last part of sewing the loops together:( It would be cool if you could post a vid for us beginners;) Either cute super scarf and great tutorial!!! Awesome tutorial and great looking scarf....Ive just been to get material from my fabric shop and they made me buy half a metre:( slightly annoyed they wouldnt cut me 15" guess thats the difference between us and uk !! This is sooo cute. I'm going to make one in my son school colors to wear to his soccer games. Thanks so much for your time and effort!! Thanks for the video....I needed to see it actually being done...not just the instructions....I luv it. Ok, I'm working on one now out of clover green and aqua blue t-shirts. Wish me luck because since I don't have a sewing machine, I am using fabric glue. So far so good! This is amazing... it's definitely on my list of things to try! I've been looking for a tutorial for a scarf like this for a while now. Thank you pinterest for leading me to your blog!!! I'm definitely going to have to try this out!! Thank you, thank you, thank you!!! You did a really great job tutoring. I will be trying it out. Thank you and keep up the great work ! love this! and thanks for the video. i have one heck of a time reading something and translating it into actual motions sometimes! Can't wait to try this - saw the "freebies" in All You magazine! This is one of the best tutorials I've found for making any scarf! And I haven't even watched the video yet! Hello, loved the scarves, will definately try to make something like this. But I don't have a sewing machine...I'll try to do it anyways..
thanks! best regards from Brazil! I understand giving out a tutorial for how to make something that's expensive, but now you're selling it in your store for cheaper? You stole someone's design and now you're selling your own version of it. Lame. hahaha yeah i am so lame. That's your response? You should be ashamed. How would you feel if you spent time and effort designing something for your shop only to find someone copied your exact design and sold it for cheaper? In the handmade community this is really frowned upon. You obviously haven enough talent to deconstruct a design and turn it "into you own" so why not spend that same amount of time designing something original? You realize you're making money off someone else's design, right? yup. thats my response. this comment is so ludicrous and off the wall, that i was willing to laugh it off rather than taking the time to spell out the inane logic of your insult, oh anonymous internet troll. but since you care enough to come back and attempt to shame me, i will give you more attention, though you are not being respectful. take a look at my etsy shop. feel FREE to take any design you see and do it better and more efficiently. i promise i wont care. if any of my designs are engineer-able by someone truly determined to recreate them, that's fine. i dont understand why you dont have a problem with me giving out the tutorial? its the exact same thing if we are talking about intellectual property or stealing orders away from someone else. i beg to differ about the handmade community. A: i GAVE CREDIT for the original idea. B: i LINKED TO THE ORIGINAL SELLER. i bet this seller has gotten tons of traffic and even sales from my reference. no frowns anywhere. i have a pretty strict code of integrity and i really cant find a trace of moral turpitude anywhere in this. the handmade community if rife with anthroplogie, jcrew and all other kinds of DIY knockoffs. giving a tutorial and crediting the source is par for the course and is legit. are you mad that walmart sells t-shirts even though they didnt come up the original idea for the garment? are you mad that mcdonalds sells their version for cheaper even though we all know chickfila clearly INVENTED in the chicken sandwich. o you buy generic drugs? or only name brand ones in the name of the sanctity of the original design? THERE IS NOTHING NEW UNDER THE SUN. i would bet that 90% of capitalism is reinventing, improving, and streamlining the wheel. do you attack every etsy seller who makes and sells cheaper versions of j crew necklaces? you must REALLY hate china as a whole. i would never be this flippant or sassy to a real person, but since you are anonymous and dont care to back up your cutting remarks with your real name, i am getting a little annoyed. one more note: i think what the hand-made community frowns upon is someone taking your tutorial (rather that figuring it our themselves) and makes and sells those items without permission or crediting the source. this has happened to me with this very tutorial. what can i do about it? nothing. lucky for me, my work is quality and people seem to like my version more than the derivatives. you'll notice that i DID invent my own design...the DOUBLE braided version. there was nothing anywhere on the internet when i first came up with that design, but there very well maybe now. if they engineered it on their own, what can i do? i dont need to sell everyone scarves, just my own little market of customers. "just like the people out there who are inspired by designers and stores like anthroplogie, but who cant afford their products, i came up with my own method for making a similar item for much less. and if they dont want/know how to sew? well then hooray for capitalism, wherein they can choose from the many scarves of all nations and prices where to spend their money." And, if you put as much effort into looking into the situation, as you did into being a troll then, you'd notice that the seller who makes these IN GERMANY, clearly states on the listing "Dieses einzigartige Produkt ist momentan leider nicht verfügbar." Which is German for, "Back off internet troll." Actually it says, "This product is currently unavailable." This is to the Anonymous idiot- what rock have you been living under? Wake up and smell to coco. What an ignorant and cowardly way to call someone out. At least have some balls to say who you are. It seems so obvious that you are envious of Keight's success. She works hard at what she does on top of that taking care her family. Shame on you. What a sad and lonely world you must live. You mess with my blood you mess with me! I think this tutorial is awesome for all the DIY people looking to save money and bring out their creative side. Plus there is nothing better than being able to create something with your hands from scratch. So, THANK YOU for making this!!!! You are awesome and funny and I love reading your blog! And to the little anonymous troll, quit picking on Keight because your jealous people stopped buying your scarf to make a better one themselves. You are just being silly, so get out of the lion's den and go home and be grumpy somewhere else!! Love it. I wish I need how to sew. It's truly very complicated in this busy life to listen news on TV, thus I only use web for that purpose, and obtain the hottest news. hmmmm, i am not sure. i am a dummy when it comes to fabric know-how like sewing with the grain por against it. throw in stretch and i am all kinds of ignorant! mine is barely stretchy (its a 60/40 poly cotton i believe) so i dont have any wiggle or slide. all i can think of (especially since your mom knows her stuff and it messed up for her too) is that its a fabric issue. sorry for the hassle! It does sound like it is a fabric issue. Stretch knits are best if you sew them with a zig zag stitch. A straight stitch will snap when pulled tight. The zig zag stitch is in a v shape so that when the fabric is stretched tight, it just widens the v and does not snap. The "not sewing in a straight line" issue sounds more like the fabric was not feeding through the machine right. This can usually be fixed by adjusting the machine feed and the fabric type. Experiment and you will probably be able to figure it out. A trick that I sometime use for fabrics that don't want to feed well is to put a sheet of paper underneath it and then sew. the paper feeds more easily than many fabrics since it does not catch, slide or pull. Then when you have finished stitching, just tear the paper off and you have a perfect seam. I use this method when I am sewing sequined, stretch lace into headbands for my daughters' softball teams and it saves a lot of time and frustration. Nice! Such a cute scarf! & you're the only tutorial I've seen for this :-) high-five. Great directions...I am a little nervous about the last steps, but I might actually try this! Too cute!!! This is fantastic! Thanks for sharing. :D Now to make one! Your tutorial is fabulous. This inspires me to go and make one now. Really appreciate this and keep up the good work! Love this tutorial. This inspires me to go out and make one now. Really appreciate the effort you put into this. Keep up the good work! I completely understand your tutorial without watching the video...but im going to watch the video anyways...just to see the price is right hands! I completely understand your tutorial without watching the video, but im going to watch the video anyways, just to see your price is right hands! Thanks...im going to make this for a friend...IF i can find a good yellow and grey!! I made it! And it's perfect! Do you machine wash and dry this scarf, or would that mess with the braid? yes you can. the braid will always be there; it is permanently sewn in. but that doesnt mean it cant get all cattywampus turned about and be quite confusing. i HIGHLY recommend washing these in a delicates bag. i might even put a rather loose rubber band around the braid just to make sure it stays put. Although this post with tutorial is over a year old - my hats off to you. Thank you! I just made one and I love it! Your tutorial is great and very easy to follow. I'm definitely making more for myself and contemplating shortening up the dimensions to make one for my 3-year-old. Thank you so much! I am anxious to try this and had no clue how to start. Your comments tickled me cause I tend to think out loud in very similar terms! It's a handmade Christmas this year due to TWO college students so this is something that I think they will actually like and that I can afford! I couldn't get the video to load so thanks again for the pics! They will have to be my guide! I am SO excited about finding your site! I was trying to find a DIY gift for my daughter's team to make for the graduating Seniors (Soccer Team) and these are perfect. Thanks! I think it's sooooo dope that you not only figured it out but you posted a tutorial AND you encouraged us to make our own and send you picts. In my book that means your pretty damn awesome! Thanks! Thanks for this. I've tried making them with fleece and it works great. I just cut the strips 10 inches wide instead of 15 because fleece is bulkier. Thanks for the inspiration. I haven't taken pics yet, but I'll link back when I post them on my blog. I am wondering if I did something wrong? I completed the scarf, but when I put it on without wrapping it twice the braid pops and it looks like a circle! Help! Thanks so much for your tutorial!! I just finished making the scarf and it was a success! I was a bit disappointed that my scarf was not as long as yours to double up, but then I read the comments. I used an XL and an L t-shirt, but my scarf came out pretty cute :) I'm already thinking about making another one haha. I made 2 of these scarves for my sisters for Christmas gifts. THEY TURNED OUT AMAZINGLY BEAUTIFUL! Your tutorial was very easy to follow and I loooove them! I am making a few today out of old tshirts! Thanks again! New to your blog and loving it! You crack me up! Also, I just made this scarf from two articles of old clothing i never wore and...it is seriously my favorite accessory now!! Thank you! Thank you so much for your simple yet completely adequate tutorial! This was my first sewing project since highschool home ec class and it was a success! Posted to my blog with a connection to yours. LOVE it!!! I really like this scarf and tutorial ! It is very clear. Thank you for sharing this ! I just did one with knit rectangles and I'm very please with the result. I really like this scarf and this tutorial. It is very clear. Thank you for sharing this ! I just did one with knit rectangle and I'm really happy with the result. something was awry with my youtube account...all set now! The video is private again! Please make public, I want to make this so badly for a friend. Saw and pinned this scarf awhile ago. Finally took the time to make it today. Instructions were super easy to follow. I made a couple changes in how I sewed the ends together, but the end result is exactly the same. Love it!!! Have to make more.